"I think I'm feeling not joy—but relief that it's over. That seems to be the default position. You could say I'm grateful—and relieved," says Colin Firth about his Oscar experience. 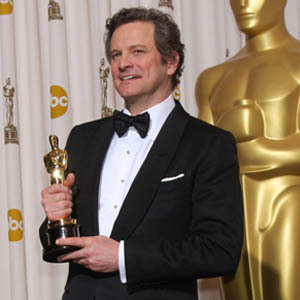 Colin Firth "felt" the support of the UK when he won his Oscar. The 50-year-old star—who picked up the Best Actor trophy for his portrayal of stuttering British monarch King George VI in The King's Speech—forgot about the speech he had planned when he took to the stage to accept the accolade but says the backing of his countrymen helped him through. He said: "I actually wrote a speech and forgot it. And that was when it came to me, that support at home. I felt it—it was very important to me." The film won a total of four awards—Best Actor, Best Picture, Best Director, and Best Original Screenplay—and Colin was said to be "buzzing" at the movie's success. An insider revealed: "Colin was King for the night. He was absolutely buzzing and good for him. Everyone in Hollywood thought he deserved it." However, he was so shocked later on in the evening that he accidentally left the gold statue in a toilet. Luckily, an attendant noticed the forgetful winner's mistake and ran to give it back to him and he carried on partying the night away. A source said: "Everyone was trying to buy him drinks. He may be 50 but he knows how to party and was determined to make the most of the occasion." Despite his exciting evening, Colin later admitted he was glad the parties had drawn to a close. He told the Daily Mail newspaper: "I think I'm feeling not joy—but relief that it's over. That seems to be the default position. You could say I'm grateful—and relieved. "The whole Oscar adventure has taken months and months of criss-crossing the Atlantic to go to Los Angeles and New York and points in between. "I don't think I'll need to go to another party ever again."